All parrot care should be this easy! Our male Blue and Gold macaw Aboo was abandoned because he was considered unmanageable and unhandleable! 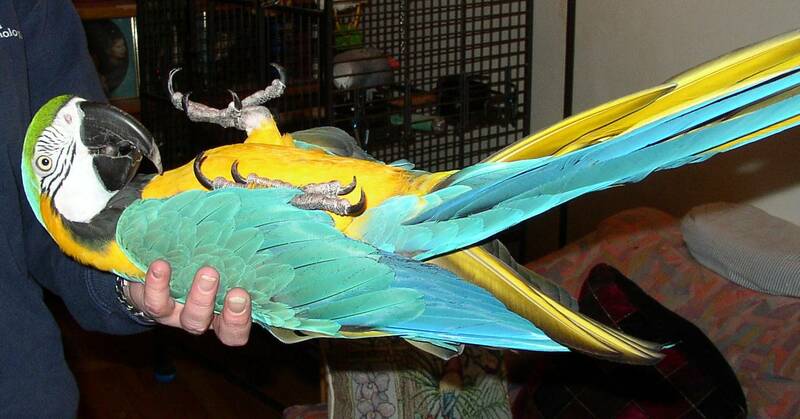 As Patricia Sund of Parrot Nation says: Parrots are "one hell of a lot of work." Whether you have one parrot or an aviary, where do you go to find useful and up to date information regarding positive parrot care and training? As a service to conscientious parrot owners, we are attempting to compile in one place links to the best parrot people currently writing and blogging about parrot care and training. If we have overlooked any parrot writers and bloggers you know of and follow, please let us know so we can add them as well. 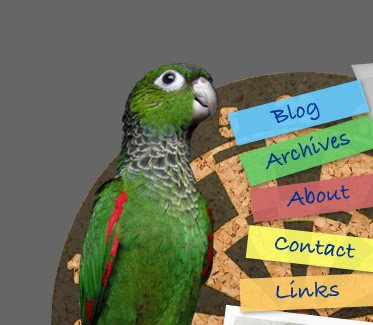 There is also a community of parrot writers who blog about parrot and wildlife conservation, many affiliated with The World Parrot Trust. We will leave these writers and bloggers for a later blog post. Since we already quoted her, we'll start with Patricia Sund's Parrot Nation. 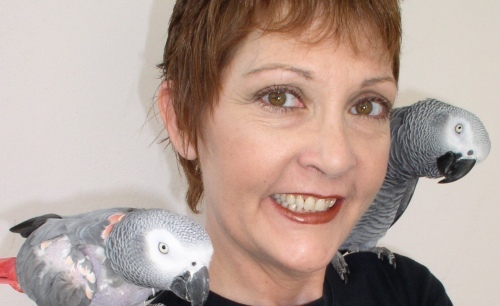 Patricia Sund's blog encompasses the world of aviculture, and especially the part of the world in which she lives with three African grey parrots in her Florida home. 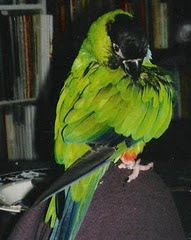 Katherine Rawson is a writer and blogger who lives with a Nanday conure, Shadow. Shadow's blog is The Parrot's Point of View. Katherine has published the picture book, If You Were a Parrot. Betty Jean Craige is a professor at the University of Georgia who lives with a gregarious Congo African Grey parrot named Cosmo, who has published her own book, Conversations With Cosmo. From Georgia we travel 6,000 miles across the continent to Alaska where a parrot writer named Donna Hart Mann lives with her Congo African Grey parrot named Rosie Red Bottom and a Cockatiel named Percy. 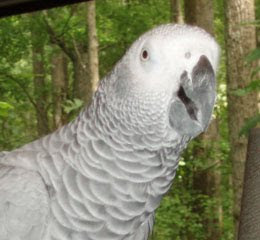 Donna documents her life with Rosie and Percy in her blog African Grey Parrot. Donna recently published a book about Rosie, Rosie Red Bottom: A Comedian With Feathers. Even farther afield, we travel to Singapore where Bryan Xie lives with his three parrots, Kacy the Black Capped Conure, Kermit the Senegal, and Kiki, an African lovebird. 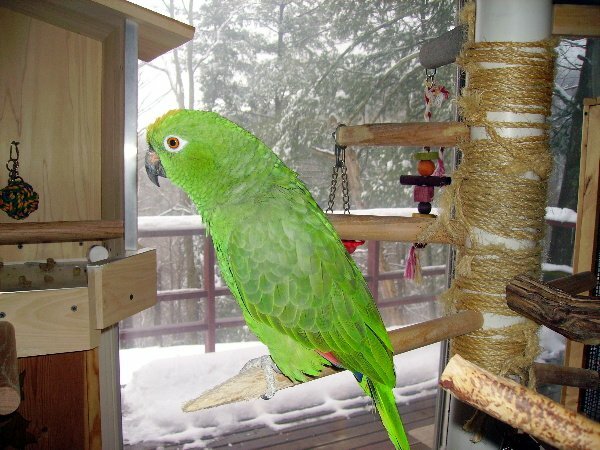 Bryan blogs about life with his companion parrots, including their care and training, on his blog Bryan's Angels. Robin Cherkas lives in Ashville, North Carolina where she writes the blog Living With Parrots Cage Free, documenting her life with her cage free Yellow Crowned Amazon parrot Coco. As Robin tells me, while she's touched on virtually every topic imaginable regarding parrots and parrot care, her blog's primary focus is simply living with a cage free parrot, the symbiotic relationship between parrot and companion, teaching both the parrot and companion behavior/life skills that promote this harmonious relationship and parrot empowerment. In addition to being a parrot person, Rebecca O'Connor is a conservationist, falconer, and writer who lives in Sacramento with her flock including Ty, an African Grey parrot, Bali, a Red-Bellied Parrot, Loki, a Senegal, as well as two falcons and a Brittany. Rebecca writes about her flock on her blog, Heckled by Parrots. Rebecca has documented her career in falconry in her recent memoir Lift: A Memoir. We await a sequel about her life with parrots! No doubt we have overlooked many parrot bloggers. Please forward their names to us so they can be added. From the generalists we will turn to the specialists. 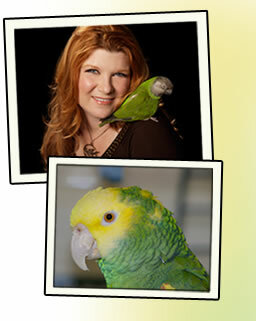 A future blog post will focus on parrot writers blogging about parrot care, training, nutrition, and flying. Stay tuned! All of the parrots are wonderful.Nice blog.